The holiday season is a time for observance of religions, giving thanks, family traditions, snowy white snow and jingle bells, visions of sugar plum fairies, and the highest suicide rate of the year. It’s also a time for excess – in gifts, in parties, in food and drink. I enjoy the food and drink aspect of the season. The turkey and the trimmings…the candied sweet potatoes…the wassail bowl…the Bourbon bread pudding…and Kentucky’s famous contribution to obesity, chocolate Bourbon balls. The holidays wouldn’t be the same without them. My choices in holiday beverages, some of which taste better than their names sound, include almost anything wet, so long as they feature Bourbon. There are choices with enticing names such as gingersnap, snow cap, winter warmer, joy to the world and the traditional old fashioned, any of which will warm up a body. My favorite holiday/winter libation, however, is the venerable and oddly-named hot toddy, a drink I first learned about as a child from my wonderful mother. She rarely consumed anything stronger than a glass of wine, but when faced with a common cold or even a hoarse throat, she believed strongly in the “medicinal value” of the hot toddy. Whether or not you are under the weather, the hot toddy is an ideal drink on a wintry afternoon or night. And it’s easy to prepare. There are various versions, but my favorite is a mixture of six ounces of hot tea (Earl Grey or lemon ginger herbal) with a tablespoon of honey, two shots of Bourbon and a slice of lemon. Some toddy aficionados like to add other ingredients, such as cinnamon or cloves, a pinch of nutmeg or perhaps a tab of butter. Others substitute brandy for Bourbon and hot water for tea. A South African version includes brand, hot water and hot tea, ginger, rooibush (red bush), honey and lemon juice. Among the things that intrigue me about the toddy is its loosely-defined history. The name probably traces to the Hindu word tari, the sap of palm trees commonly fermented into an alcoholic beverage in India. In many non-Hindu Indian villages, the offering of Naravan (an alcoholic “toddy”) is consumed at ceremonies honoring fallen heroes who sacrificed their lives for good causes. It is likely that one or more merchants of the East India Company, who were known to enjoy their spirits, took the recipe back to their damp and chilly homeland of Scotland. Other reports say that the drink originated in 18th century Scotland “to make the taste of Scotch more palatable.” In his 1721 poem, The Morning Interview, Scottish writer Allan Ramsey refers to the Tobian spring, also known as Tod’s Well, the source of water for Edinburgh and the local Scotch industry. Some believe Tod’s Well gave birth to the term, toddy. The toddy even has a song named for it. “Hot Toddy” was written by 1950’s big band leaders Ralph Flanagan and Herb Handler. The song was recorded by Ted Heath and Julie London and some 80 other artists. Flanagan’s orchestra is credited with popularizing the “Glenn Miller sound”. Aerosmith later recorded a version of the same song. “Are you ready? Hell yes! Damn right! Hotty Toddy, Gosh almighty. Who the hell are we, Hey! Flim, Flam, Bim Bam, OLE MISS BY DAMN! 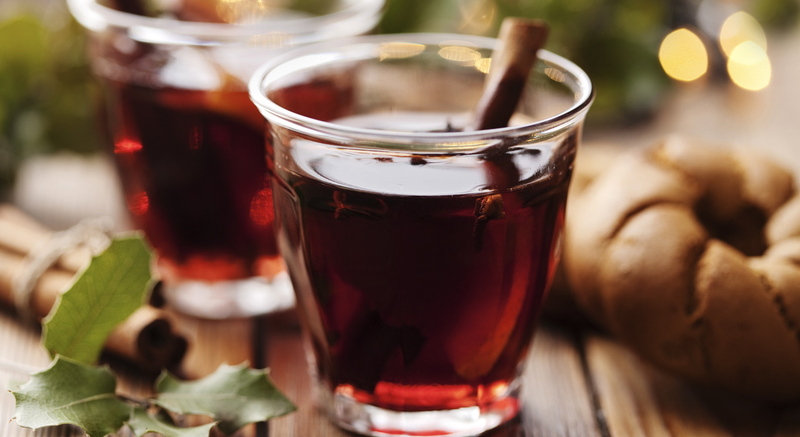 On January 11, 2014, the nation celebrated the first National Hot Toddy Day. Who says Americans don’t appreciate the significance of historical events? While not everyone subscribes to the “medicinal value” my dear mother ascribed to the beverage’s healing ability. The American Lung Association, for instance, recommends against treating the common cold with alcoholic beverages on the basis that they have no curative effect and may cause dehydration. Sorry, but I have to raise my glass to my mom on this one. The post Musings On A Winter’s Day – The Hot Toddy appeared first on The Bourbon Review.